Women for Women UK Major Gifts Officer Nora Russell traveled to Kosovo in June. She has written about her experiences and the women she met. This part 3 of 4 in her series. Check back later for the last update. A gloriously sunny day started with the official opening ceremony, where the newly appointed Country Director of our Kosovo Office, Iliriana Gashi, was joined by Carol Jackson from the Private Equity Foundation as well as Molly Cronin from Sharon Davis Design Studios. The official ceremony featured speeches from Iliriana Gashi, Carol Jackson, Molly Cronin and Ramize Rexhepi, a graduate of Women for Women’s year long programme in Kosovo. Iliriana thanked the trainers of the Women for Women programme: “Thanks to our trainers who go 4 or 5 times a week to remote villages, in snow or sunshine to deliver our programmes and support women with literacy and vocational skills.” After hearing Besa’s story earlier this week, I truly believe this too. 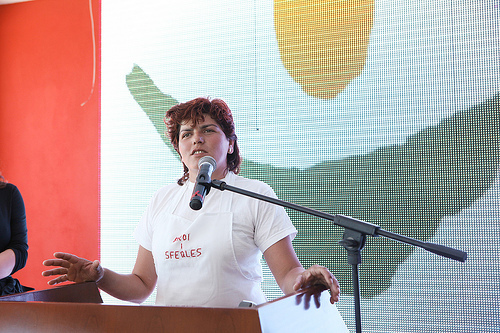 Next to speak is a graduate of our programme, Ramize Rexhepi , who chose to specialise in horticulture and food processing and has now set up her own women’s cooperative producing pickles, Burek and Ajar. The ceremony was closed with a beautiful rendition of ‘Songbird’ by singer and UK supporter of Women for Women International Laura Comfort. After the ceremony I had the chance to catch up with Ramize and hear her story of moving from survivor of the war to active leader of a 17 woman strong cooperative. Ramize laughs, “Now we have no problem and it is seen as normal, in fact now my family are always asking – when are you going to the next fair?” Her father is so impressed that he has given the cooperative 5 km square to support the development of their business, which they hope to build a processing factory for pickling and preserving . She says her most profitable product is the jars of Ajar, a red pepper paste and Pinxhur and similar product that is made from tomatoes. The guests then shared a lunch of traditional Kosovar food, catered by graduates of the Women for Women programme and were able to browse a women’s product fair, featuring handicrafts, food and honey. Supporters then also had the opportunity to tour the new WOC facilities and visit different training activities and classes in a open house, including an opportunity to view our Life Skills classes, Vocational Classes and letter writing. After the Opening ceremony we took a bus trip to the old city of Prizen, walking to the top of the City Fort, once built by the Ottomans. Our guide tells us how she and her family were unable to leave the city during the war (unlike many of the city residents) and that as an 8 year old child she watched how the city burned and the fear this struck in her. Ramize Rexhepi, WfWI-Kosovo graduate, addressing the attendees at the inauguration of the first Women's Opportunity Center in Kosovo. We meet the group a group of exited supporters and including representatives from the Private Equity Foundation and Neal’s Yard Remedies, at the departure lounge in Gatwick, London. The short (3 hour) flight to Kosovo is filled with expectation and the knowledge that as soon as we land it will be all systems go! As we fly over Kosovo, you can see the strips of land, divided into thin sections. I am shocked to learn that in this country of such fertile land, 80% of the food is imported and in the past year food prices have risen 50%. For the average family on an income of 250 Euros per month this has had significant effect upon their ability to afford the ‘luxuries’ of school books and a nutritionally balanced diet. More and more families rely upon remittances form relations working abroad. I meet Faruk Beqa, WfWI Kosovo Income Generation Coordinator and Vehbi Kllokoqi, the Income Generation Manager and they take myself, Lauri Pastrone and Simon Wheeler, our photographer to visit the local Green Market. The Income Generation staff teach women to grow vegetables for their own family nutrition and then to expand and sell some of their produce in markets like this one. Vegetables fetch 10 times more than standard crops of wheat and corn which are more staple and popular with farmers. Main crops include vegetables, strawberries and cherries in June. They also teach our participants how to grow onions, potatoes, carrots and cucumber and peppers, a favourite for pickling in preparation for the harsh winters. Cabbage is also popular as it is the main ingredient of a local cabbage & salt water drink prepared especially for the winter months. The day ends with a beautiful and traditional meal of many courses on the hills overlooking Prishtina and as the sun sets Besa, one of my Kosovo colleagues takes courage in telling me her own story of experiencing the war, which officially started in 1997, but which was the result of many years of segregation of the two communities – Serbian and Albanian Kosovars. Besa was 16 years old when the war began, she was living with her parents, her nine year old brother and her grandmother. When Serbians entered their home they were given 3 minutes to pack and leave. Her parents were taken to a village and Besa, at 16, took on the responsibility of getting her grandmother and brother across the border into Macedonia. They took a bus. And then the bus broke down and they walked across the border, setting up a makeshift shelter amongst the other 500,000 refugees who had fled Kosovo into Macedonia. They stayed there for 5 days until they were able to take a place on Germany’s quota for refugees. Besa says she chose Germany as it was the closest to Kosovo and easier to get home. She was always thinking of returning home. Whilst in Germany she heard that there had been a massacre in the village where her parents had been taken and not knowing whether her parents were alive or dead she waited by the phone to hear of news of them. The phone lines were cut when Nato bombed the Post Office and all main communication routes. Besa refused to go to school in Germany although she sent her younger brother and she says he was hysterical, crying and having nightmares every day. Finally she heard the good news that her parents had survived the war and were safe and after 9 months they were able to return to Kosovo and found her parents. Besa now leads our women participants in life skills training classes. To me this is amazing, she is the same age as me; could quite easily fit into my friendship group in the UK and yet at 16 she wasn’t studying for exams or going gooey over her first boyfriend. Instead she was fleeing for her life, responsible for two vulnerable family members and without her parents to turn to for help. She sits opposite me with such resilience and composure and now she is working to change the lives of women who have similar stories every day.